While I was on a building spree and working so terribly hard at making that one side of the garage look nice I was having a really hard time with the view when arriving home. Other than the neighbor's car which hasn't moved from that spot in well over a year I didn't like seeing the trash cans next to the garage. 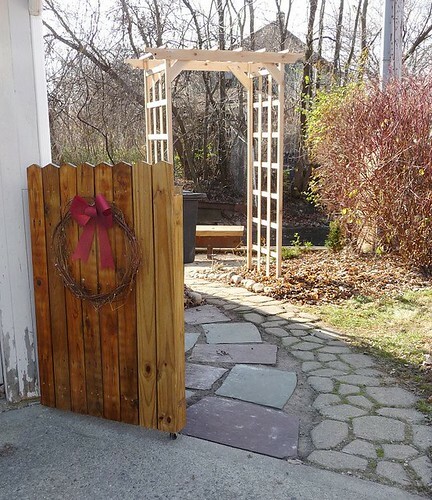 Since I still had treated wood from tearing down the dog house and I discovered several pickets from the fence I built over a decade ago I decided to build a "gate". 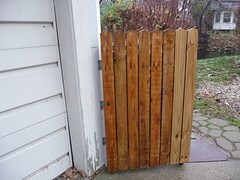 Of course the gate wouldn't really open to another area, but it would swing out and allow more access to the garbage cans if needed. I also installed a caster on the bottom to aid in rolling and since I knew the garage isn't straight the caster would act as not only a roller, but also a stopper. Brilliant! Ok, not really, but anyway another project was started. 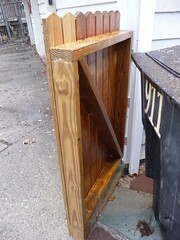 There are 3 coats of marine quality urethane on the gate which unfortunately caused the "age" of the wood show since only 2 of the pieces had never been installed outside.